Join us on Friday 30th September (4pm - 7.30pm) and Saturday 1st October (10am - 5.00pm) when in conjunction with IsoTek we will be running an event highlighting the benefits of mains conditioning and how that it can bring you closer to the music. The IsoTek team will be on hand to answer any questions you have. The quality of the electricity we feed into our Hi-Fi and AV systems has a profound effect on its performance. The first input into any system is the mains electricity, it flows through the system components which in turn creates a signal that eventually moves the loudspeaker cones. The mains supply is distorted by numerous factors as it travels from the power station eventually to be distributed throughout our homes. The noise created in the mains supply can and does have a substantial effect on the performance of any high quality audio / AV system. The escalation of mains borne noise created from items such as kitchen appliances, computers, games consoles and airborne noise from wireless networks mobile phones, etc is having a significant effect on the quality both our Audio/ AV systems. IsoTek EVO3 Genesis one - Designed for single front end components. Multiple Genesis ones can be used from a single mains outlet. Dynaudio Confidence C2 Platinum Loudspeakers. An outstanding loudspeaker from the Dynaudio stable. We will also have available for demonstration the new Clearaudio Innovation Basic turntable. We will also have available the Clearaudio Smart Matrix and Double Matrix record cleaners. If you have any records that you would like cleaned we can show you how effective these record cleaners are at bringing your records back to their original performance. (We can't take scratches out though!!). This service will be limited to three records per person. We will put the names of all attendees into a prize draw giving you the opportunity of winning an IsoTek EVO3 Premier mains cable worth £99.00. The draw will be made at the end of the event day on Saturday. This is a great opportunity to hear how much you can improve the sound quality of your system and an affordable and worthwhile Hi-Fi upgrade. Jon, Farid and the team from IsoTek look forward to seeing you. Audio T Southampton Summertime Store & Hi-Fi News! We may have been quiet on our store blog for a while but we have certainly been busy! We have just finished a makeover of our store. It's now looking clean and bright with freshly painted walls and new carpet throughout. Here's part of the shop front with walls resplendent in crisp Atlantic Surf, white with a hint of blue, replacing tired old magnolia! The new carpet tones in with both the new shop colour and the dem room. The dem room walls are painted in soft grey, befitting the lower light conditions required for home cinema. To go with our new shiny shop we have a lot of new products to show you. 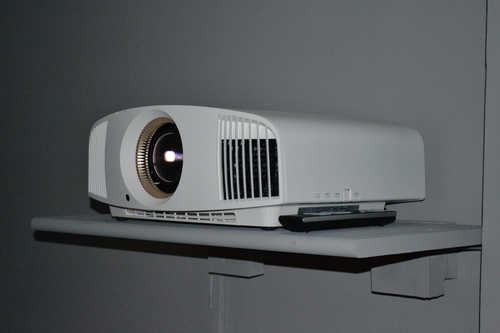 Our new Sony VPL-VW320ES 4K projector is producing spectacular images to complement the great sound in our Dolby Atmos dem room. With the demo room in music mode we have been wowed by the awesome sound of these stunning Dynaudio Contour S 3.4LE speakers, in beautiful high gloss Bubinga finish. Running from a Naim NAC N-272 streamer/pre-amp into our brand new NAP300DR power amplifier, with mains conditioning courtesy of an Isotek Sigmas this system is truly spectacular. IsoTek's Titan and Mosaic Genesis mains regenerator are currently on hand for those who want to push audio performance to even greater heights! Interest in vinyl continues to grow and we have some new turntables in store to suit all budgets. Teac's TN-300 is a well engineered and beautifully finished record player for £299.95. Ours looks great in lacquered cherry, one of five superb finishes available. Rega have impressed us with both the superb build quality and performance of the new Planar 2 and Planar 3 models. Fantastic sound at affordable prices as always from Rega. We thought it was time to offer another great British turntable brand so now have a magnificent Michell Gyro SE. Currently fitted with a Dynavector 10X5 it's not just beautifully engineered but sounds superb. It looks good on our new carpet too! Moving from source to speakers, we are delighted we now have some of the new PMC Twenty5 range on demo. The Twenty5 21 look splendid in oak. The cabinets are even better quality than the Twenty 21, our previous favourite compact speaker, and improvements in all key areas have really raised the audio performance to great effect. Twenty5 23 looks set to overtake Twenty 23 as our most popular floorstanding speaker, building on the strengths of the earlier model whilst maintaining the all important compact, domestically acceptable, cabinet. The Twenty5 24 is a revelation, sounding markedly superior than it's predecessor. Our demo pair look splendid in Amarone finish. Twenty5 22 and 26 will be in store soon. We can't wait! So, we have lots of new products for you to see and listen to in our newly refreshed store. We look forward to welcoming you into our comfortable demo room very soon. P.S. Watch this space for exciting news of a very exclusive product range arriving imminently! The Cyrus Phono Signature Arrives in Enfield! The Phono Signature takes form in the classic half sized Cyrus chassis which perfectly integrates into any Cyrus Hi-Fi system. This die-cast aluminium chassis provides superior electrical shielding and a mechanically vibration-free enclosure for all of the critical audio components housed within. With just a week to go until our Isotek event on the 4th and 5th September we have some exciting news updates for you! Isotek distributors Sound Fowndations have confirmed that they will be bringing the entire range of Isotek products all the way up to the awesome Super Titan and Genesis! Prepare to be amazed as you hear the improvements each Isotek upgrade makes from replacing a standard plastic trailing socket all the way up to the world's most powerful audiophile mains conditioner, Super Titan and the world's first multiple mains generator, Genesis! As if this isn't enough to tempt you in we will have exclusive Isotek offers during the event and a prize draw with first prize of a Polaris power bar with mains conditioning, worth £294.95, and second prize of a Premier mains cable which retails for £99.95! It's a great opportunity to experience the enormous audio benefits of mains conditioning, meet and quiz Isotek experts, enter the prize draw, and to take advantage of the event offers. We look forward to welcoming you in store on either 4pm-8pm Friday 4th September or 10am-6pm Saturday 5th. Debates continue to this day amongst hi-fi enthusiasts as to which source is the best. Many say good old vinyl but streaming quality has advanced in leaps and bounds and the current choice of great CD players and DACs shows that there is still plenty of life left in the silver disc. Whichever format you favour, they are all capable of providing enormous listening pleasure and musical involvement. We will explore and demonstrate the quality of some outstanding turntables, CD players, DACs and Streamers at our forthcoming audio events so do check out our store page regularly to ensure you don't miss out on our Autumn Audio Extravaganza! We will have exclusive offers to tempt you as well as prize draws and the opportunity to listen to some great music on awe inspiring systems! Our first event, on the 4th and 5th September, features Isotek products with experts from the company present, to explain the science and demonstrate the performance of their impressive range of power cables and and mains conditioners. This event aims to dispel arguments about the relative benefits of different source components and to demonstrate that the real source for any hi-fi system is not the digital or analogue front end. In fact it's the mains power supply. We all know the source first principle of sytem hierarchy, and, however much we all tweak our hi-fi systems, in the search for hi-fi nirvana, Isotek will show that the first priority should be to tackle problems with the mains supply. It really is a case of rubbish in rubbish out. Without the mains supply we all take for granted our hi-fi systems would remain silent but there's a lot more to the electricity supply than just the provision of voltage. We are all bombarded with RFI and EMI from the ever growing number of electrical, especially wireless, items in use preventing our hi-fi systems from working optimally, however much money we spend on other upgrades and tweaks. Isotek have solutions to deal with all aspects of cleaning up the dirty and worsening mains supply and getting your system singing. 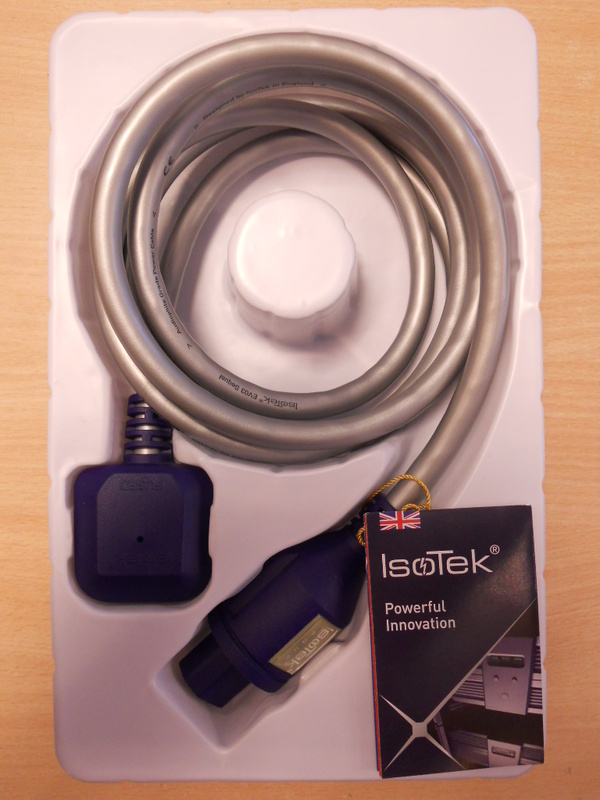 Just £99.95 for an Isotek Evo3 Premier power cable to replace the throwaway mains lead provided with most products will yield huge benefits. Isotek will show how much more can be done to ameliorate the negative effect of dirty mains on your musical enjoyment with better power cables such as Sequel at £199.95. Prepare to be amazed when a system is transformed by the mightily impressive Sigmas Mains Conditioner! 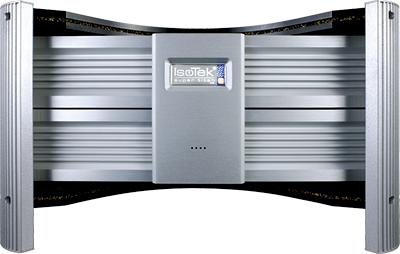 The improvements Isotek mains products can make to any system, regardless of price, are so profound that we really don't want you to miss this golden opportunity to quiz the experts from Isotek and we are sure that you will be as stunned as we were when you here what Isotek can do to enhance your hi-fi! Don't forget we will also have exclusive Isotek offers and a prize draw - watch this space for more details very soon! Do come along after 4pm on Friday 4th September (until 8pm) or between 10am and 6pm on Saturday 5th. In the words of Keith Martin, founder and Managing Director - think power, think Isotek! Audioquest Jitterbug - Best £40 Upgrade for your Hi-Fi? Just arrived in Portsmouth the new Audioquest Jitterbug USB Data and Power Noise Filter. All you have to do is plug this USB filter into any audio based USB socket, like in our Naim Superuniti pictured above. Or you can use it in-line with any USB cable, for example going to a USB DAC. It makes an obvious improvement/change to the sound of the system, making it more refined. It also seems to reduce the noise floor, and generally makes the system sound cleaner. Come in for a demo and hear for yourself! It gave me great pleasure to present one of the winners of our recent Naim Powerline Competition this weekend. Mr Andrews was over the moon when I called him to let him know he was one of the lucky winners, quite funny when I had to explain that I wasn't joking! And as he said "Got to be in it to win it!". So keep an eye on the eClub newsletters (sign up if you haven't done so) and in store for future competitions and make sure you get your entries in, the next winner could be you!! The Isotek EVO 3 Sirius is a very serious 6 outlet power bar that will protect and improve any Hi-Fi system. Priced at £450 it may be the best value upgrade you could ever make. Removes common and differential mains noise. Drops the noise floor by 40dB! No cross contamination between sockets. Multi-strand silver plated OFC cable with a PTFE dielectric. If you own a good HiFi system then you owe it to yourself to try this out (idealy with a matching IsoTek mains lead). Our very first Naim event in our new dem room proved to be very successful. We didn't think a dem room could sound so good, especially in hearing the differences between the new DR power supplies. 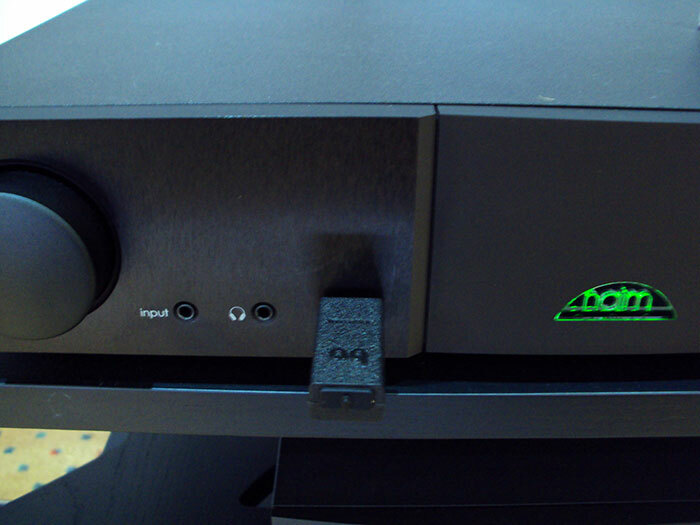 Naim Audio's new NDS digital streamer was on show and the general consensus amongst our guests who attended was " we want one! ". Watch this space for further news on future events.